In our series of motherboard buyers guides, here’s the latest update to our list of recommended motherboards. All numbers in the text are updated to reflect pricing at the time of writing. We're once again back with our quarterly look at the PC motherboard market. For the first quarter of this year there has been a lot of buzz around impending AMD releases such as Zen 7nm, but for the motherboard market, the big shift has come in the higher end of the market. At CES a few of higher-end models dominated proceedings (literally), with the announcements of the ASUS ROG Dominus Extreme and the ROG X399 Alpha and X299 Omega models. But, by no means ignored, we're also blessed with no shortage of good motherboard options in all other product segments as well, ranging from the premium to the budget to the SFF markets. Our recommendations for motherboards are based entirely on my personal and professional opinion. There are notably a large number of different motherboards across a host of chipsets, so I selected my top four picks based on the four segments, regardless of chipset. From our Best Motherboards Holiday 2018 guide, not much has moved in the motherboard market except for the very upper echelon of chipsets e,g X399 and C621; this guide is revised to reflect that. For users looking for other options, we've also gone over multiple chipset families as well in the links below. Building a truly high-end system comes at a price; usually one far out of the reach of the regular consumer. One such example is the Intel Xeon W-3175X, which offers 28 unlocked cores of Skylake fury to chomp through whatever is thrown at it. Taming an overclockable 28-core processor doesn't just require enthusiast level cooling, but it requires a solid and high-quality foundation; the ASUS ROG Dominus Extreme. The EEB form factor ASUS ROG Dominus Extreme is built around the C621 chipset and was the first motherboard to support the $3000 Xeon-W3175X processor (GIGABYTE has since lifted the lid on its C621 Aorus Extreme, and more details expected towards the end of Q1/beginning of Q2). The cornerstone of the Dominus Extreme is of course its 32-phase power design, which is capable of shrugging off the Xeon W3175X's massive 265 W TDP and allowing users to go farther with the unlocked CPU. There is also support for up to 512 GB of ECC and non-ECC RAM, with twelve slots allowing for hex-channel memory configurations. ASUS also includes two ROG DIMM.2 slots, allowing users to install up to four M.2 drives in total, all with support for Intel VROC. The board also brings two U.2 ports and a total of eight SATA ports for additional, off-board storage. Other highly notable features include dual LAN with an Aquantia AQC107 10 GbE NIC and complementary Intel I219-LM 1 GbE NIC, an Intel 9260 802.11ac MU-MIMO Wi-Fi adapter, and a ROG SupremeFX S1220 HD audio codec. The board also comes with four full-length PCIe 3.0 slots that operate at x16/x16/x16 or x16/x8/x16/x8; leaving plenty of expansion options for additional AIC SSDs, network controllers, accelerators, and other high-bandwidth cards.. Being an ROG product, Dominus Extreme offers plenty of features for overclockers. An overclockers toolkit is integrated onto the PCB and offers a total of twelve 4-pin fan headers as any system built on this board is going to require big cooling solutions. 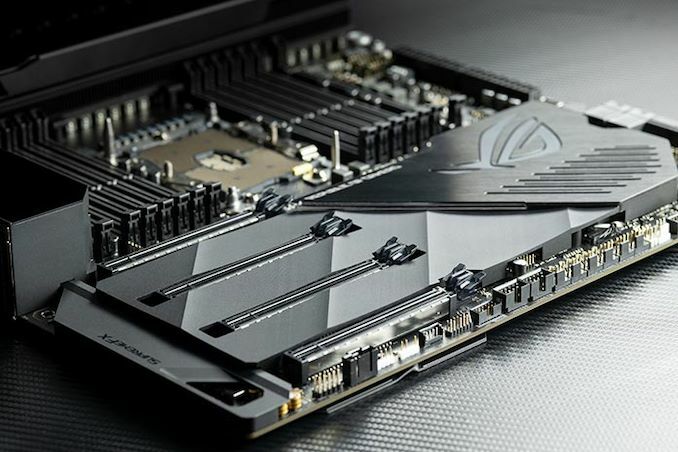 With a price tag of $1800 at both Amazon and Newegg, the ASUS ROG Dominus Extreme targets users with big wallets as the outlay on just the Xeon W-3195X CPU ($3000), this motherboard ($1800) and a 192 GB memory kit (up to $3000) alone is more than some users would pay for a car, let alone a system. If money is no object, this kind of setup offers unparalleled high-core performance and with an unlocked multiplier on the CPU, more performance can be squeezed out with the right configuration. Looking at the massive stack of Z390 motherboards currently on the market, a lot of the product ranges are catered towards gamers. One of the most prominently marketed component-based gaming brands is from ASUS and the Republic of Gamers brand. 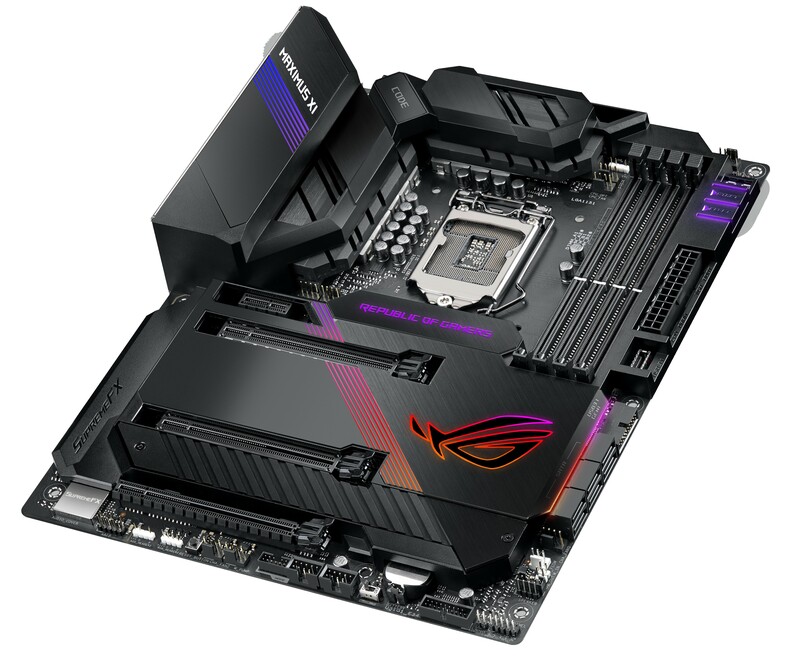 ASUS has three main gaming focused motherboard brands at present with the entry-level rebranded TUF Gaming, the mid-range Strix and the higher end Maximus series. My pick for performance and gaming users is the ASUS ROG Maximus XI Code. With its blend of armored up aesthetics, performance focused 8+2 phase power delivery and capacity to support DDR4-4400 memory out of the box, it's a good overall package. The ROG armor features a solid black theme which stands as a stylish and neutral backdrop for the multi-zoned RGB which is customizable with the ROG Aura Sync software. With support for two-way SLI and up to three-way CrossFire multi-graphics card setups, it's a solid foundation for a stylish gaming system. The ROG Maximus XI Code has a pair of M.2 slots hidden beneath the ROG armor covering the majority of the PCB and also includes six SATA ports too. Some of the more useful features for gamers include the SupremeFX S1220A 7.1-channel HD audio codec as well as the inclusion of the Intel 9560 Wi-Fi 802.11ac module, the latter of which is capable of supporting speeds of up to 1.73 Gbps (2T2R). Otherwise, one of the things which can make or break a user's gaming experience is software, and ASUS is at the top of the game as far as that goes with included software such as the GameFirst V utility for better network performance. As far as the pricing goes, the Maximus XI Code is currently retailing for $344 at Newegg and an even lower price of $290 at Amazon. With pricing current at the time of writing, $369 isn't a bad price all things considered. 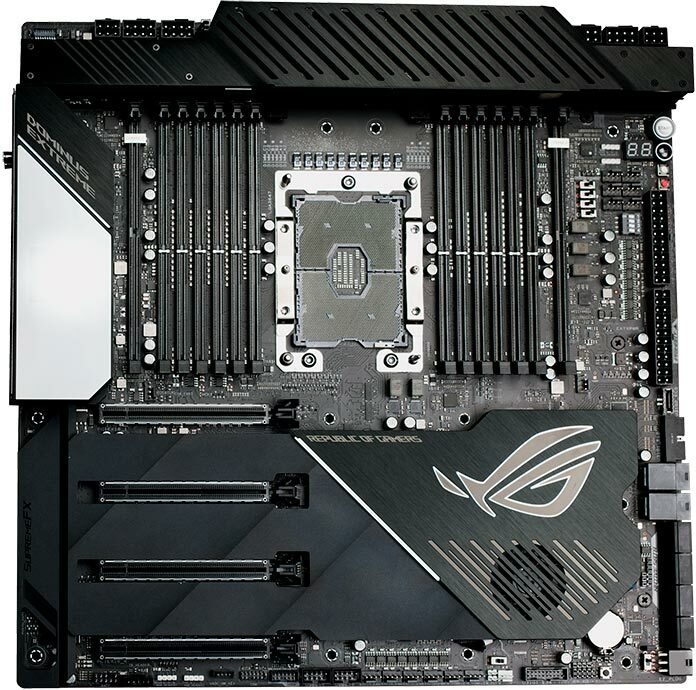 The next model up in the stack is the ASUS ROG Maximus XI Formula, which retails for $450 and has extra features such as 5 GbE NIC and an EKWB water block integrated to cool the board's power delivery. This makes the ROG Maximus X Code look even more desirable for the money. Moving onto the value pick for Q1 2019, I've opted for the MSI B450 Tomahawk, which is based on a very welcomed platform for gamers and content creators on a budget. It's no secret that AMD hit the right performance metric with its Zen architecture, and its good value isn't just limited to the processors, but the motherboards too. The MSI B450 Tomahawk is the epitome of value with a variety of low cost, but effective features in a package which costs $120 at Newegg. This is a little higher than the MSRP, but it still isn't a detriment to what's on offer. A mixture of black and grey patterning across the PCB, with gunmetal grey heatsinks and an array of RGB LEDs in the top right-hand corner, makes this a neutral foundation for a Ryzen-based single graphics card gaming system. The MSI B450 Tomahawk has a pair of mid-range controllers with a Realtek ALC892 HD audio codec and Realtek 8111H Gigabit LAN. Also present is a single M.2 slot, six SATA ports, and two full-length PCIe 3.0 slots with support for two-way CrossFire. There's support for DDR4-3466 memory, and MSI includes a robust software package to complement this good valued option. 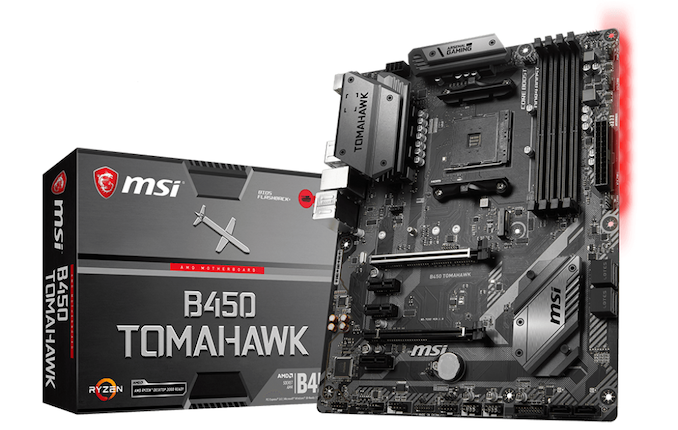 The B450 Tomahawk currently costs around $120, which, outside of the X470 chipset boards and MSI's own B450 Gaming Pro Carbon AC, offers the best value in my opinion of all the ATX-sized B450 motherboards. The amount of smaller but equally adept hardware is on the rise, and to complement this, vendors are cramming even more features and componentry onto their mini-ITX motherboards. One standout model from the smaller-sized crowd is the new ASRock Z390 Phantom Gaming-ITX/ac, which on paper looks like one of the most comprehensive models in a long list of ASRock's small form factor series. The Z390 Phantom Gaming-ITX/ac has a wave of features including two M.2 slots, four SATA ports, two RAM slots with support for up to DDR4-4266 RAM, and a very desirable Thunderbolt 3-capable USB Type-C port on the rear panel. Other prominent features include four USB 3.1 Gen2 Type-C ports, DisplayPort and HDMI 2.0 outputs, and a clear CMOS switch is also located on the back panel. Networking is handled by an Intel 9560 802.11 2T2R Wi-Fi adapter and a single Intel I219V NIC, which is more premium than what some full-fledged ATX models offer. For overclockers, a solid looking 5+2 power delivery is more than adequate to propel the new Intel Core i9-9900K to its limits on ambient cooling, and the ASRock Z390 Phantom Gaming-ITX/ac even has some RGB LEDs on the rear of the PCB (located just behind the full-length PCIe 3.0 x16 slot). Last month we pitted two premium mini-ITX Z390 motherboards against each other, the ASRock Z390 Phantom Gaming-ITX/ac and the ASUS ROG Strix Z390-I. 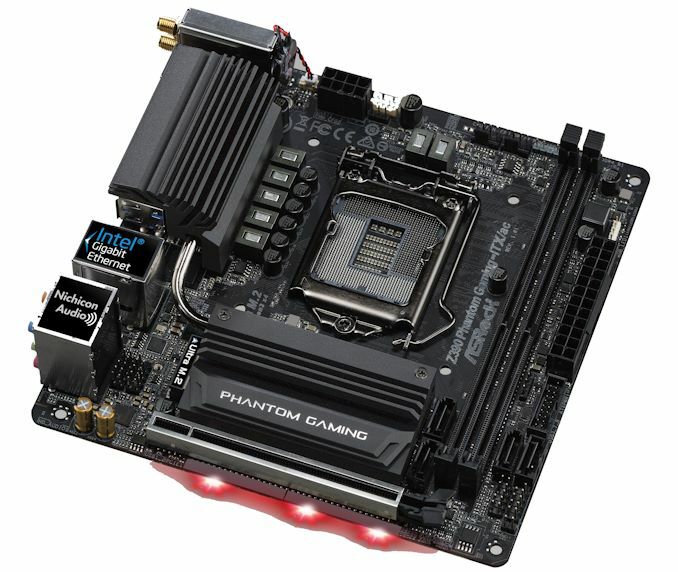 Our analysis and conclusions indicated that the ASRock Z390 Phantom Gaming-ITX/ac isn't just one of the best mini-ITX motherboards currently on the shelves, but one of the best motherboards in the mid to high-end motherboard segment. At Amazon, the current pricing sits at $209, whereas the ASRock Z390 Phantom Gaming-ITX/ac is available from as low as $180 at Newegg; a further price drop of $10 since we reviewed it last month. I'm back, decided to add a few options of my own... To make it quick/easy for myself I stuck with AsRock options since they tend to provide a good value at any price point. I'll try to highlight the ones I added with bold tags . If anyone had the time they could add a secondary option for each category (like Intel's socket 2066 as an alternate high end option). Same thoughts. AMD is on par now with Intel and can save a bit on the cost of an AMD board.